Keeping with my recent end-of-year theme of refreshing well-received past posts, I’ve decided to provide a follow up for last year’s highly successful post 8 Ways to Better Market Yourself on LinkedIn in 2015. 2015 has been a breakout year for LinkedIn, both as a social network and (more importantly) as a content hub and distribution platform. As of Q3 2015, LinkedIn had over 400 million active users and 37% year-over-year growth. Much of this growth is being fueled by LinkedIn’s doubling down on content hosting and distribution. In an ever-crowded content marketing landscape, finding new avenues to reach consumers and build your audience is a high priority, and LinkedIn represents an underused (yet highly promising) opportunity to drive the quality visibility and engagement you’re looking for. 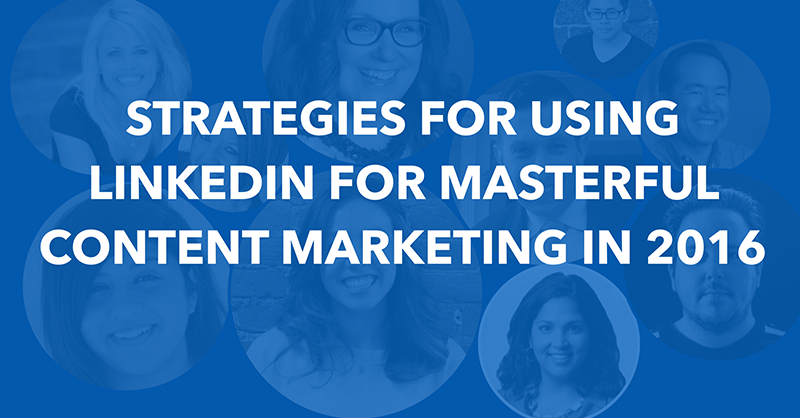 What’s one way brands can better master content marketing on LinkedIn in 2016? Below are their insightful, actionable and engaging answers. Ritika Puri is a content strategist and co-founder of Storyhackers. Her recommendation not only highlights some interesting, often overlooked LinkedIn features, but also shows how they can be used to strengthen your networking connections. This post will highlight many of these unique opportunities, but Ritika’s answer is very important because it calls attention to the fact that these opportunities exist in the first place. Pam Moore is the founder, CEO of Marketing Nutz, a Social Media, Digital Marketing, Experiential Branding Agency. Her answer is a great springboard off of Ritika’s, because once you realize that LinkedIn as a platform has potential, then the next step is to maximize that potential. Rebekah Radice is currently the CMO of Post Planner and has an incredible track-record as an independent consultant for social and content strategy as well. Her advice centers around identifying the core high-level approach that brands should take when they are attempting to establish a presence on LinkedIn. Simply put “viewing LinkedIn as a static site to house yet another company profile is a mistake.” Rebekah notes just how common this problem is and then offers advice on how to fix the issue. The core of LinkedIn’s new direction is their rapidly expanding Pulse publishing platform. Rebekah urges marketers to treat this new avenue for content delivery very seriously. Aaron Lee holds the colorful title of “Grand Master of Customer Delight” at Post Planner and also self-publishes social insights on his excellent blog AskAaronLee.com. Aaron points to a recent report published by LinkedIn profiling the ten most successful brands on the platform. Aaron’s advice is to take the lead from the biggest brands and then usefully extract two core insights. Tip 1: Have employees share and post your content: Your employees are your biggest advocates. Get them to help your brand in your content marketing efforts on Linkedin. 99% of the top global brands had employees share to their networks. Can’t get more actionable and straightforward than that. Sabel Harris is currently the Director of Demand Generation at Contactually and has previously worked at several big digital players such as TrackMaven and General Assembly. Sabel’s advice directs our attention to an incredibly unrealized avenue for LinkedIn influence – your employees and coworkers. After all, LinkedIn is nothing but a network of professionals, and particularly well-connected individuals within your organization can help maximize the profile of your organization as a whole. “One of the great things about LinkedIn now is that anyone can publish on it’s platform and you can use this to your advantage.” This aspect of LinkedIn enables companies to leverage the connections of individual employees and open themselves up to entirely new audiences. Anita Newton is the VP of Marketing at one of the leading digital advertising companies in video and social, Adknowledge. She has worked in the sales and marketing industries for 20 years and has had an illustrious career to say the least. 1) Will this make my members of my network smarter? 2) Is this a positive reflection of my personal brand? 3) Would I be proud to have my (boss, mentor, recruiter) read this article? Dave Kerpen is a stalwart within the world of digital marketing and is the founder and CEO of Likeable Local. Dave’s advice is something that I have publicly espoused on this blog many times – repurposing content is key. Peg Fitzpatrick has an outsized reputation as a social media consultant and has most recently generated a ton of positive attention after co-authoring the book The Art of Social Media with the famed Guy Kawasaki. In much the same way that Dave Kerpen’s comments mirrored previous posts of mine, Peg Fitzpatrick’s answer also serves to reinforce an idea I have championed passionately on this site. This idea is that in order for content to reach it’s maximum potential, it must be accompanied by strong visuals. I find this to be a particularly insightful comment in regards to LinkedIn, where many people are not constructing the content natively for sharing and many company updates have images that are formatted strangely or incorrectly. LinkedIn is a professional platform, but even professionals are going to be swayed by quality visuals if they are accompanied by substantive content. Dennis Shiao is the Director of Content Marketing at DNN and a contributor author to the book 42 Rules of Product Marketing. Dennis gives a two-pronged recommendation and each half of his answer is equally important. First of all, brands need to promote their content on LinkedIn and promote aggressively. These are just a few ideas, but the most important thing to takeaway is the high-level potential LinkedIn has for both bolstering your existing content and informing your future content. Jason Miller is the Head of Global Content Marketing for LinkedIn, which lends a whole degree of weight to his advice, and he certainly doesn’t disappoint. The first thing Jason points out is that focusing on creating content is meaningless if you are not constantly optimizing that content for maximum reach. The use of the tool helped to create broad appeal for this top-of-funnel piece of content since it could be suited to a variety of personas active on LinkedIn. With so many features, and so much forward momentum, LinkedIn is no longer just a professional social network – it is a content-creation and distribution platform that should be top-of-mind for your content strategy come the new year. I hope this article has inspired you to take a renewed look at LinkedIn and given you many ideas on how to go about leveraging this highly promising platform in 2016. Lastly, here are these same LinkedIn marketing tips in a ready to pin infographic!